[Montreal, Canada—April 5, 2016] — With more and more hotels successfully leveraging the power of mobility and the cloud to simplify their in-room amenities and minibar operations via the ABreez by Mobile Simple app on Android, Mobile Simple announces that this award-winning tool is now available to staff using Apple iPhones and tablets. With the click of a button, all hoteliers can now capture revenue, increase guest satisfaction and improve staff efficiency with ABreez for Apple and Android. Unlike mobile websites and hybrid apps, ABreez native apps enable room attendants to perform daily tasks even when they are not connected to the hotel’s WiFi. In a typical hotel environment, multiple WiFi access points are strategically located throughout each floor enabling room attendants to automatically connect and input or access data as needed. If the WiFi signal is lost, ABreez will automatically synchronize all data once connectivity is restored. “Since our launch in 2014, we have mapped out a cross-platform strategy to offer the best mobility experience to hoteliers,” Pigeat said. “The challenge came in building a flexible user interface that works well on all different screens. The Mobile Simple team has done an excellent job in designing this flexibility. To download ABreez for the IOS platform click here: ABreezAppleStore. 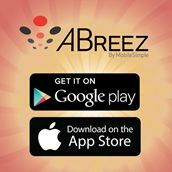 To download ABreez for the Android platform click here: ABreezGooglePlay. Click to view the ABreez VIDEO. To learn more about the FREE 30-day trial, click HERE. To experience ABreez, preschedule an appointment with Mobile Simple at HITEC 2016 in Booth #1018, to be held June 20 to 23 at the Ernest N. Morial Convention Center in New Orleans. Call 800-467-5892 or email christelle@mobile-simple.com. Looking for Minibar Management Software?